I followed everything to the letter, performed my “conduct system test” (a button on the same page…did you click the one above? Sorry…it’s not real. haha) and passed the “check” with flying colors (HINT: if you do not have a webcam set up/connected, it will just sit and wait with no communication back to you on the screen. Once webcam was connected, each “check” showed “loading…” and then “passed” very quickly. I think this needs some work on their end!) In fact, leading up to my exam on Friday, I tested my laptop each day just to make sure. So back to 8:45 am on my exam day as I logged in….the first thing the Questionmark server does is a whole “new” system check. Again, there is NO on-screen information during this, so you pretty much have to sit and hope something is going on. After what seemed like 3 minutes or so, the screen showed all the test. It was the same as the other “system check” you can do, but this time it showed an error on one check…it said I had “IE8 compatibility mode” set (this will be important later). As I was using Firefox, I had no idea what this meant. I did see a “connect to proctor” button, so I clicked that. This took me to a new page…all white….except “waiting for proctor…” sitting in the center….and just sitting….no indication anything was going on at all. I waited a few minutes. It was close to 9am then, so I closed out of the exam browser and used the “contact technical support” link for “live chat” with a support agent. First up was Blaine. He was helpful and had me check a few things…launching from Chrome….launching from IE…..he checked the proctor queue and said he never saw me in it when I tried again. Soon however, it was 9:15 am and my exam window had passed. They give you only 15 minutes passed your exam time to sort out technical issues. Blaine said he was sorry but to reschedule. My appointment was marked “Abandon_TI” (abandoned due to technical issue). I immediately jumped back on the Certification Hub and was able to reschedule for 10 am. While waiting I checked everything I could. Second time around, I logged in at 9:45am and already saw the exact same issues. I jumped right on technical support live chat. This time, I got Fredrick. I explained the situation and what happened before. I will say that he was fairly useless (no disrespect meant), but he was honest about it. He said there was pretty much nothing he could do on his end as it was likely some issue on mine, so he said he would have to escalate it. He said it would be at least 60 minutes till I would get an email and then go from there. 60 MINUTES?!?!? I went back to trying some things as I still had about 20 minutes left. Same thing ….”waiting for proctor….” and nothing happening. Before time was up, I got another tech agent…this time Blaine again and let him know what was going on. He did say to turn off any anti-virus/firewall software I had running, so that was helpful. He said this time to just try to launch and sit on the “waiting” screen up till I ran out of time (just to make sure it was not an issue of the proctor queue). I did that…same thing….timed out…”Abandon_TI”. Again, I rescheduled…this time for 2:30 PM…and yes, I was pretty steamed at this point. I went to lunch and waited. Getting stuck at the waiting for proctor screen can have many different causes. It is most often caused by third party software on the client computer blocking the specific communication necessary to make that connection, even if the ports are otherwise open. Some examples of this type of software are things like Websense, Symantec DLP, or certain third party firewall apps. It can also be caused by attempting to take the exam on a computer that is connected to a company network, as the network monitoring and blocking settings are usually out of the end user’s control in those environments. We advise that you take all of the steps below, and then try again. Adjust the Global Flash settings. Click the “Camera and Mic settings by site” button. Scroll down to “Port tests”. Turn off all popup blockers and any real-time malware, spyware, or virus scanning software, and any firewall or port blocking software. This includes software such as Symantec DLP, and Websense, which blocks specific types of communication over otherwise open ports. Turn off Compatibility View completely in Internet Explorer. Even if you are using a different web browser, the Questionmark Secure Browser that opens for your exam uses the settings within Internet Explorer, and Compatibility View will cause issues. Adobe Flash was not up-to-date nor enabled (I had it turned off for security reasons.) Soooo although their “check” makes sure you have Adobe Flash installed, it does NOT check that it is enabled. Did you notice #5 above? It does NOT matter what browser you use to click your “start exam” link, it will ALWAYS try to launch Questionmark in MS Internet Explorer! So THAT is where the “IE 8 Compatibility” check comes from. After following those much better “tips” and waiting for the day’s DDOS attacks to end, I was finally able to login the SAP Certification Hub and launch my exam at 4:45 pm. This tiime, everything went perfectly. The “system check” passed every check…and actually the page looked better with Adobe enabled for some reason. I then clicked the “connect to proctor” button, and this time got a whole different looking page than before…not to mention seeing myself in my webcam and the proctor as they connected by video as well. With that….the exam began. Oh!….and I did pass. (haha) Just hoping these tips help others and save them some of the frustration and anxiety I went through on exam day. As for passing the exam, well….you are on your own there….study hard!!! As always, I will keep blogging if you keep reading them. Till next time…. Thanks for sharing Chris and EVERYONE I know has had various system issues with taking the exam. SAP/SuccessFactors should be holding Questionmark accountable as it makes them look very bad. My name is Angela O’Leary; I work as the Client Services Manager at Questionmark Computing. I work very closely with the SAP team that look after the SAP Certification Hub. Thanks for raising these issues in your blog post, whilst it is, of course, very disappointing for us to read, your feedback has been very valuable. Based on your feedback we have already made changes to our processes, as well as looking at how we can improve other aspects of the customer journey. Oh wow! Thanks! Glad to know I could help. It really just is the “little” things that make such a BIG difference. Hi, Due to Technical issue if we are not able to complete the test and status as Abandon_T1 for that same day we have to reshedule it or we can shedule any other day as per our avilability? please confirm? You can reschedule immediately for same day (which is what I kept doing till it worked out) or you can do it another day. Basically, you just get out of the cert exam for that scheduled time without using up one of your certification “uses” (6 per year with the sub) and just start the process over (ie. schedule). I’m getting Question Mark Browser stopped working window while connecting to proctor window. System tests are successful before launching the exam. I have gone through your blog,made all the mentioned settings. Contacted to SAP support team for verification of settings,installed-re-installed question mark browser,antivirus removed from system,firewalls all tested,they have confirmed ,good to go.Still facing the problem. My OS is Windows 10.I’m trying to take exam on Chrome/IE 11. Kindly let me know if any setting need to be done. You are asking the wrong person. I just relayed my experience as a warning….not because I can do “support” for you. I would work/contact Question Mark or SAP Certification group and sort it out. Similar experience here as well and one of the proctors I was dealing with was not helpful at all.. Overall, not impressed with the Questionmark service, very unreliable. If you show up on time for an exam, you shouldn’t have to reschedule due to technical problems that are not found until you wait 25 minutes in a queue and get a hold of a proctor. Spent almost an hour in between queues due to exiting the application to fix technical issues only to lose the ability to launch the exam (40 minute window now). With no other available times for the same day or even the next day, I am left to reschedule in two weeks after my business trip.. 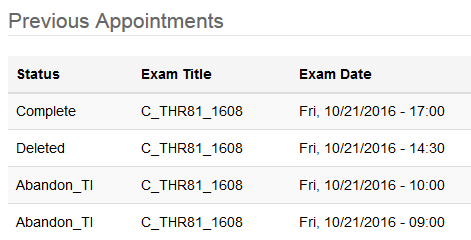 Scheduled my exam for Friday @ 13:30 because after that I was going away for 2 weeks and wouldn’t be able to dedicate study time or run through a test. Logged in at 13:15, everything passed in the system check (I did checks a couple times through the week as I was paranoid things would fail). Got it, went in the queue for a proctor. Waited 25 minutes to get a proctor. Got a proctor but she noted that I was not in the meeting and to click accept on the popup. Unfortunately the popup button were all disabled. She asked what browser I was using, Chrome, which supposedly is not good even though it’s listed in their recommended browsers. She told me to close and re-open with IE. In the meantime I checked all the FAQs and other information before I reconnected, just to be sure. I logged in through IE and sure enough same problem. The next person I got through to was not an actual proctor but someone that sends you to the queue. He asked if I was having technical issues. I replied yes and explained the situation. He said, exit and use the FAQ to fix your problem. I promptly responded that the FAQ did not have any guide to fix my problem. His response “exit and contact technical support or search the internet and fix the problem before launching your exam”. I closed the session and pulled out my laptop, quickly downloaded questionmark, did the system check and launched the exam. This time the Agree button worked and I was able to get in the meeting room… Unfortunately there was some kind of issue with my webcam on my laptop that the proctor could not see me… great… “Please exit check your settings and try again”. Turned out I had my default for the webcam turned off to prevent webcam usage during Skype business calls. Fixed that, no problem there. Log back in and launch button is gone!! Seems like they have changed the timings from this original post, according to technical support it’s now 40 minutes. After that, the link is gone and I have to reschedule. Look at available times to reschedule, there are none for Friday or even Saturday (I leave on Sunday).. Sorry to hear/read about your frustrating experience. I have not had to test again yet and was hoping they had ironed out their issues. The lost attempt for technical problems was reimbursed and when I did get a chance to schedule my test it worked fine. Just the initial ironing out of bugs seemed to be the problem. Hopefully they fix their automated system checks for future new users to help prevent problems from happening on test day. Good luck to all those taking the test through this service for the first time! Make full use of the 15 minutes ahead of your scheduled time to get things going. I am not able to run certification test. Even after following all the steps, and your guidelines about Flash Player, I always encountered the same error message, even after changing the settings. “Your browser has scripting disabled”. In order to take an exam within the Certification Hub you will need to enable scripting in Internet Explorer. However system is not able to detect this. Has anyone been able to resolve this issue? I was scheduled to take the exam today. I have followed the guide exactly and tried for ‘System test’ and it failed. My webcam works with other softwares, and have the latest version of Flash Player. I have tried all other options (the ones mentioned in this blog), etc etc … and failed to have a successful ‘System test’. I am worried as to how I should resolve this issue now. I have written an email to SAP, and awaiting an answer from them. I am unable to run the questionmark, I get a message that Centra is running and I have no idea what centra is. I have SAP and my IT guy at work and none of them could understand what centra is. Lol how would I uninstall it? after this , login to certification site , where appointment is fixed , start button will be enabled and need to take exam. Pls help me to confirm upon flow so as to avoid any confusion. For Mac User there is still an issue. I have booked my access last year in may 18 and Questionmark did not work even yesterday. Use Windows OS rather than wasting your time. I could do it spending couple of hours (Installing Win 10 on my Macbook -(check youtube to see how) My Mac has 2 OS now and QM works on windows fluidly.